"Now You Can Get Our Entire Training System For HALF OFF!" I'm offering a 50% discount on our acclaimed teacher training system. The course sells every day for $97.00 ...but you can save 50% and get the entire copy for just $48.50! Click Here And Get Your Complete Copy For Half Off! When I was a new teacher, I too came very close to leaving the teaching profession within 5 years. I was already in my 3rd school after only 3 years of teaching. I had no idea what I was doing. In one of my classes, a tall boy stood up in the middle of my Science class, looked me straight in the eye, and said “You can’t boss me.” He refused to sit down. Within seconds his classmates were on his side, refusing to follow my instructions. I panicked and fled the classroom to the office. I lost control and respect of the classroom. My administrator told me that I lost the respect of my students by leaving the classroom. I was humiliated by the experience. The next year I found myself transferred to another school, which was much tougher than the one I had left. My assignment also changed. I was now teaching French as a second language to 7 classes of 12 year old students every day. I taught every 12 year in the small village where I lived. Students and parents knew where I lived, where I shopped, what I did. The next two years were dominated by confrontations with aggressive, unmotivated and miserable students. My classroom management skills were horrible. My students were dismissed by the bell, not by me. As soon as the bell rang, they took off out of my classroom in an unruly mob, ignoring my feeble attempts to tell them what was for homework. I then spent valuable time straightening all the desks and chairs back into rows. After only 4 years of teaching, I wanted to leave. I was burned out, stressed out and emotionally exhausted. I didn’t want to ask for help. I didn’t know where to turn. I didn’t know what to do. Ten years later the entire school staff, student body and parents came to an assembly to see me receive The Prime Minister’s Award for Excellence in Teaching Mathematics, Science and Technology. It was my 5th major teaching award. After 29 years of teaching, I recently retired on my own terms. I can help you achieve fantastic results in just 7 days from now when you use our Thrive and Survive in Your Classroom teaching program. Our program will show you the secrets and shortcuts on how I did it. You won’t have to put in years of struggling like I did. That’s my goal for you. I want you to be able to listen to the audio, read the lessons in one sitting, and then immediately USE the information in your classes the very next day. Your words and website have been a wonderful blessing for myself and coworkers to keep our heads up and hearts in the right places these last two years as we experience more demands with less resources and support. Thank you for being part of the reason I didn't give up on teaching last year. THANK YOU! THANK YOU! This is fantastic. You're making my life as educator and leadership coordinator so much easier. Without your shared knowledge my nights would have been VERY short. I'm at a loss for words to really express how grateful I am. I am sure that you have made a huge difference in many an educator's life. Your contribution towards education is enormous. We are very fortunate to have you in our busy lives. Yes, it is as if Marjan Glavac, with all the answers to our problems and the most fantastic ideas to make education interesting, is a personal friend right here in the next room. Your shared knowledge is much appreciated. You are making a difference in education. In one word, this course was practical! The content of this workshop covered all the necessary areas needed to assist teachers in limiting the amount of STRESS we all tend to experience. Surveying teachers prior to creating the content of this course was key! The presenters are experienced educators who clearly recognize the daily challenges we face in the classroom. With each session, Paul and Marjan were willing to listen to our concerns, and then did not hesitate to offer suggestions, even if it meant getting back to us via email. I will definitely be implementing many of these new techniques for the upcoming school year. Thanks again Paul and Marjan! I teach 2nd grade and started the "card system" in my classroom this week and what a difference it has made already. Thanks to you and Paul for the tremendous amount of hours and planning to make this wealth of information available to teachers! THANKS ONCE AGAIN FOR THE VALUABLE ADVICE AND INFORMATION! Cheryl, Grade 2 Teacher Michigan USA. Finally, affordable professional development to enable you to be an ideal teacher. I am a retired Principal who has spent much of my years lecturing and talking about the things that you both touch on. I find your ideas complimentary and refreshing. It is great to see people still focussing on meeting the needs of the people in education. Well done. I will recommend your products to my clients and participants. As I worked through the teleseminar, it seemed as if a mirror was held up to my eyes. This process of reflection helped me to define where I need to focus my efforts in my teaching. I don't think I could have done it by myself. I teach 2nd grade and started the "card system" in my classroom this week and what a difference it has made already. Thanks to you and Paul for the tremendous amount of hours and planning to make this wealth of information available to teachers! THANKS ONCE AGAIN FOR THE VALUABLE ADVICE AND INFORMATION! It is really practical, timesaving and realistic. 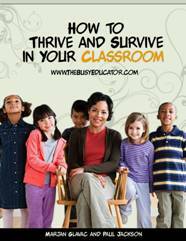 When you start listening to our How to Thrive and Survive in Your Classroom Teleseminar, you'll learn these powerful strategies from three experienced, innovative and dedicated educators – Marjan Glavac, Paul Jackson and Joe Martin! Marjan is a retired classroom teacher with 29 years teaching experience. He has taught students from the inner city, students with emotional/behavioral disorders, ESL, and IEP students. 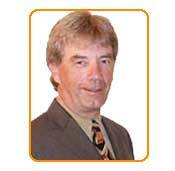 He is an international speaker and workshop presenter. His customized keynotes have included the following topics: Chalk Board Lessons From The Digital Age; Going Beyond The Rainbow (Or How To Be A Great Teacher); Burn Bright or Burn Out - Motivating Teachers for Life. The Roberta Bondar (first Canadian female astronaut) Award for Science and Technology. The NORTEL National Institute Award for Excellence in Teaching. Selected to participate in 3 NORTEL Summer Teacher Institutes. The Prime Minister’s Award for Excellence in Teaching Mathematics, Science and Technology. The Roy C. Hill Award for Educational Innovation. Paul retired in 1998 after a teaching career including 20 years as a classroom teacher and 12 years as an Elementary School Principal. Paul's interest in the teaching/learning process led him to share his love of learning through teacher-focused workshops both locally and internationally. Among his topics: Stress Management – A Personal Look; A Little R and R for the Soul – Reflection and Reflection; Burners and Blisters Go Together – When Helping Hurts (Enabling); Your Dreams Can Come True; It Can Happen to You. His philosophy of "Helping people help themselves" revolves around the concept that "without reflection, experience is not cumulative". Paul recognized that in order to have an impact as a Principal on each and every one of the students in the school he must have an impact on the teachers. To attain that goal he devoted himself to training school administrators in the supervision and evaluation process so school administrators could impact what went on the classroom on a daily basis. During a sabbatical he wrote, "Formative Supervision Through Data Collection and Collaboration", a training manual of data collecting instruments for use in the classroom by administrators and teachers. 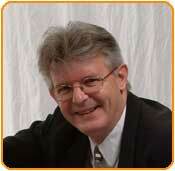 Joe Martin is a nationally known speaker, respected university professor, author, and educational consultant. He became the youngest faculty member ever hired to teach at a state university in Florida at the age of 24. He also has the distinct honor of being the youngest professor at his institution to ever be nominated twice for the “Distinguished Teacher’s Award.” Joe has taught students at all levels in K-12, including Title I, alternative ed, and gifted students. He also trains more than 15,000 teachers and administrators a year. Joe has addressed more than 750 organizations, associations, businesses, colleges and universities, and public school districts, helping hundreds of thousands of students and staff members across the country achieve more, live and serve more passionately, and maximize their leadership potential. The Association for the Promotion of Campus Activities selected Joe as its national “College Speaker of the Year.” And Joe was nominated “Lecturer of the Year” by Campus Activities Magazine. You'll get an extensive 176 page handout of notes, resources and strategies to make you the best teacher you can be. In addition, you’ll have downloadable recordings of all the sessions with both Marjan and Paul. These support materials are second-to-none, unique and readily applicable to your classroom situation beginning tomorrow. “I feel like I’m talking to a brick wall. Joe shares with you 21 of the most powerful questions you can use to “get through” to almost any teenager. Each one is tried and proven – and Joe gives you specific instructions on how to use them and when to use (and why they work). Students who are bored with school and much much more. Half of life is “If”! I'm So Confident That Our Thrive And Survive In The Classroom Teleseminar Will Work For You, I'm Backing It With A No Risk 8 Week GUARANTEE! You can’t lose with our 100%, ironclad, money back guarantee. That's right! We’re so confident that Our Thrive And Survive In The Classroom Teleseminar will make you a more effective teacher, that we don't mind offering you an iron-clad 100% money back guarantee. In fact, if you don't feel that Our Thrive And Survive In The Classroom Teleseminar digital recordings help you in the classroom then we’ll refund your money in full. No questions asked. Okay, How Much For ALL THIS VALUE? Don’t Delay. Download all resources right now! School Purchase Orders Accepted. Please e-mail Marjan at: marjan at glavac dot com for more details. Our 100%, ironclad, money back guarantee makes this a no-lose offer for you. We’re here to help you overcome all the frustration and negativity that happens to all teachers. We want to teach you how to handle the everyday details of teaching, so you can focus on the big picture. 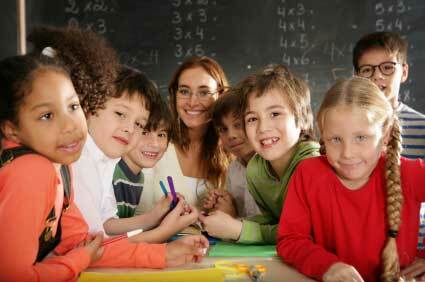 We want you to enjoy teaching—one of the greatest and most personally rewarding professions in the world. You need to take action now to get the classroom you deserve. We want you to overcome any fear or doubts you may have about getting that ideal classroom. What we’re saying is - listen to our teleseminar and decide for yourself. If it doesn't meet your expectations, rejuvenate, revitalize and renew your teaching career, if it doesn't work for you, you have nothing to lose because our 100%, ironclad, money back guarantee will return your money with no questions asked. Be a life long learner! If you need more information, just e-mail Marjan at: marjan at glavac dot com with Teleseminar in the subject line. P.S. Think about this--you deserve to have your ideal classroom. 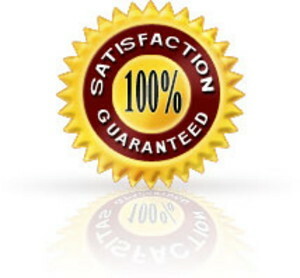 P.P.S Remember, our 100%, ironclad, money back guarantee will return your money with no questions asked.